Creating a Lean culture, or for that matter creating any positive change, seems very difficult in some organisations. They seem to have a form of entropy where all improvement regresses quickly back to the mediocre normal. Observing these companies, we often find four big cultural barriers – complacency, low expectations, learned helplessness, and passive acceptance. Over the past three months we have looked at how beliefs among employees and leaders can be barriers to change. Complacency, low expectations and learned helplessness are all based on beliefs. By contrast, this month’s barrier to change is about leadership behaviour. The first three cultural barriers I have explained are beliefs, while passive acceptance is a behaviour demonstrated by leaders. 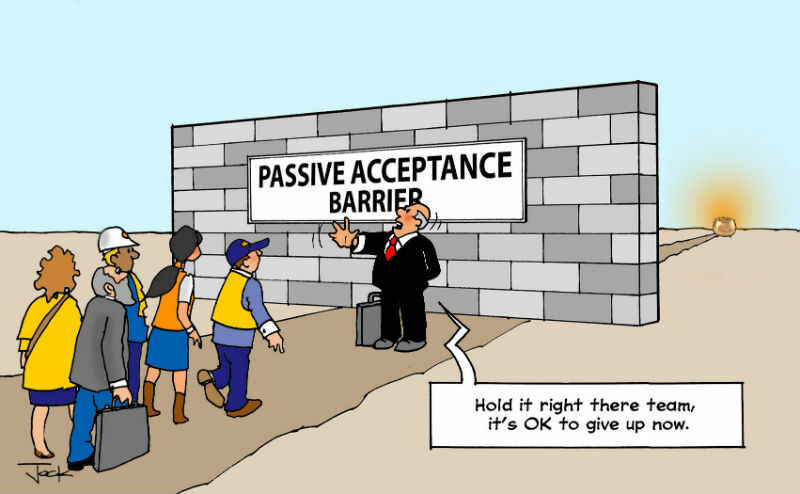 Passive acceptance occurs when leaders passively accept a situation that does not meet the standard they have set. This could be something simple like ignoring when 5S controls are being met or audits not completed. It can apply to any standard in the business, including safety standards, quality standards or governance standards. Most leaders are very busy and it is often easier to keep walking, than to stop and ask why a standard is not being followed. Often questioning the non-standard behaviour or non-compliance may lead to a conflict with the employee involved and managers might prefer to avoid this conflict. Why is Passive Acceptance a Problem? “The standard you walk past is the standard you accept”. EVERY time you, as a leader ignore non-compliance with a known standard in your business, you send the message that the standard is not important. 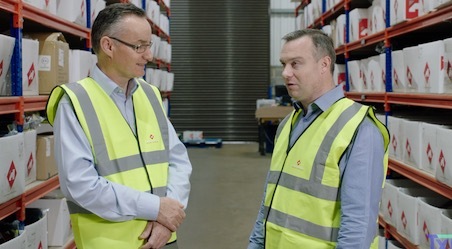 This can have tragic consequences in safety where ignoring minor safety breaches such as failing to properly isolate a machine or speeding on a forklift can lead to tragic consequences. Standards are the bedrock of Lean. Therefore, if you are going to have any success at implementing and sustaining Lean successfully, you as a leader must never accept it when standards are not met. Otherwise the entropy of complacency and low expectations will drag your business back to mediocrity. This one lies entirely with you, the Leader. If you want to set and maintain standards you can never afford to walk by when those standards are not being met. You MUST take the time to stop and ask why. You also must match your statements and your actions. No-one will believe you are serious about 5S if your office is a mess. Likewise, the message about quality will never get through if all you ever talk about or worry about is output. Summary of the Four Cultural Barriers to Change. Every business has its own unique culture. However, having worked with hundreds of organisations we have found these four big barriers to creating a Lean culture over and over again. Individually, each one of these barriers can completely thwart your efforts at change. Combined, as they often are, they are an intimidating challenge. However, break down one and the others tend to quickly fall. Being serious about achieving goals and maintaining standards is key. This article provides you some practical strategies first to recognise these cultural barriers in your business and then to overcome them. It will come as no surprise that the onus falls on leaders at every level in your organisation to make the difference when creating a Lean culture. However, for now the change starts with you to demonstrate that you are not a victim of learned helplessness and to start applying Lean in your area of influence.